Take KOLA to work and Win! Listening to KOLA at Work just makes the day go by faster! And to add to the fun, you can win KOLA’s At Work Freebie! Simply enter to win each time the prize changes! Each Friday during the contest, Vic Slick will pick a winner just after 4pm. 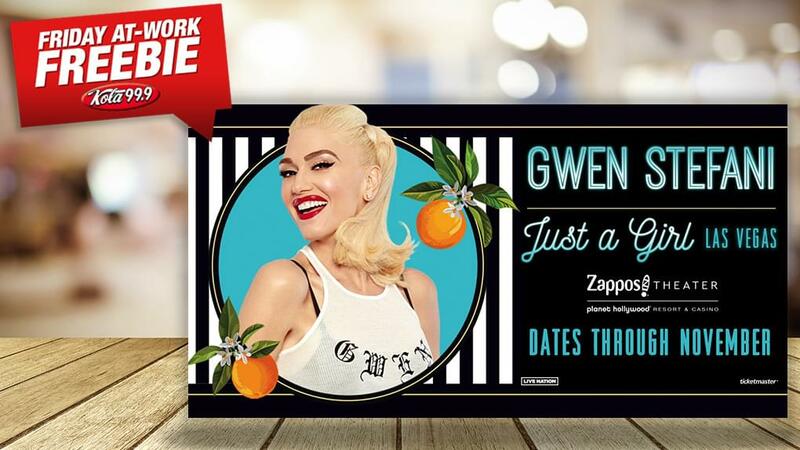 If your entry is randomly chosen, you’ll win a pair of tickets to, multi-Platinum recording artist and global icon, Gwen Stefani returning to her headlining residency, “Gwen Stefani – Just A Girl” at Zappos Theater at Planet Hollywood Resort & Casino, July 5th – 26th. PLUS a two-night stay in the newly-renovated rooms at Planet Hollywood Resort & Casino! Planet Hollywood Resort & Casino is the centerpiece of the famed Las Vegas strip, with 2,500 beautifully designed guest rooms and suites showcasing some of the best views in town, and endless options of unparalleled shopping, distinguished dining, popular entertainment and a bustling nightlife. Planet Hollywood encompasses more than 100,000 square-feet of gaming, several lounges, ten restaurants including Gordon Ramsay BurGR, KOI, Strip House, the award-winning Spice Market Buffet, LA’s Pink’s Hot Dogs, Pin-Up Pizza and Ringers Wings, Pizza and Sliders, and the Planet Hollywood Spa by Mandara. The resort is also home to The Zappos Theater and its resident headliners Jennifer Lopez, Lionel Richie, Backstreet Boys and Gwen Stefani. The property is encircled by Miracle Mile Shops with more than 170 specialty stores and restaurants. For more information, visit www.planethollywoodresort.com. Find Planet Hollywood on Facebook and follow on Twitter. If you haven’t entered to win the current prize, get entered now! No points necessary to enter. Starting Monday, April 15th, listen for the Friday At Work Freebie Bonus Code! You’ll hear it during the hours of 9am, 12noon and 3pm. Use that bonus code to instantly earn 5,000 points!